Short version: The Stoning of Soraya M. is an important film that needs to be watched - especially considering the current world political climate. 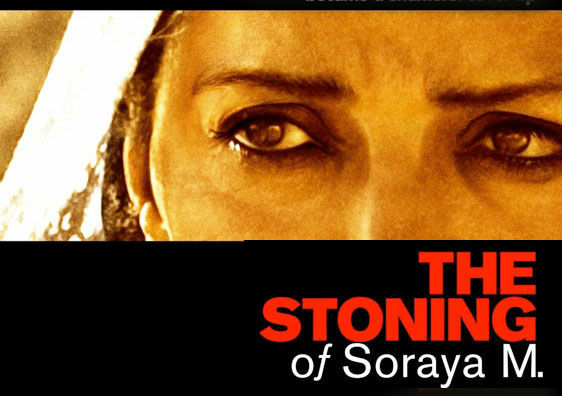 Screen Rant reviews The Stoning of Soraya M.
The Stoning of Soraya M. is based on a true story and a book by Iranian-French journalist Freidoune Sahebjam. It is about the stoning death (murder, more accurately) of a 35 year old woman in a small village in Iran during the rule of Khomeini in 1986. James Caviezel plays Freidoune, an Iranian expatriate visiting Iran on assignment when he runs into Zahra (played with usual intensity by Shohreh Aghdashloo), Soraya's aunt, who convinces him to visit her to listen to her story. He is reluctant at first (seemingly sharing some native attitudes about womens' lack of worthiness), but Zahra's forthrightness and intensity convince him to give her a chance. He turns on his tape recorder and she begins to tell her tale. Soraya (Shohreh Aghdashloo) has two boys and two younger girls and is financially trapped in a marriage to her prison guard husband Ali (Navid Negahban). Ali wants a divorce so he can marry a 14 year old girl, but does not want to commit to the financial support of Soraya and their daughters. Soraya would not be able to support and feed her daughters with just the house and land he wants to leave her (he wants to take the boys with him). Ali beats Soraya, who has been rejecting him due to his treatment of her and his dalliances with prostitutes, but being a "man" is adamant that he will not let her have her way in an equitable divorce agreement. The film takes place just a few years after the Shah was overthrown, and there are people who were loyal to the Shah and others who are loyal to religious leader Khomeini. Ali knows that the town Mullah (religious leader) was a Shah loyalist and in prison after the overthrow - so he threatens him to find a way to get Soraya to agree to a divorce on his terms. There is also the mayor, Ebrahim (David Diaan) - he was a Shah supporter but is doing the best he can to get by in the current regime. He seems essentially fair - but weak. One thing leads to another and a conspiracy is formed to accuse and convict Soraya of adultery - a crime punishable by public stoning to death. Just based on the title, you know the ending is inevitable - and the further I got into the film the more my heart was in my throat anticipating that ending. Soraya is portrayed as an honorable woman, just trying to do what she needs to in order to support her children. But two false witnesses are assembled (all that is required to accuse a woman of adultery and demand a hearing) and of course as a woman she has to prove her innocence instead of the men having to prove her guilt. Zahra remembers life before head to toe burkas and stands up to the men in power in town (and Soraya's husband). There are no marks against her since her husband died and I guess widows are at least treated with a bit of respect - but she is ineffective in convincing anyone of anything (she is still just a woman after all). In the end people are threatened, a kangaroo court is formed, and Ali gets his way. There is nothing to be done and Soraya resigns herself to her fate, entrusting her daughters to Zahra. Eventually the title event of the film arrives - the closer we get to it, the slower the film seems to move... making it seem right around the corner but taking its time arriving. It is a brutal scene and not over quickly. Yes, it's very hard to watch (and some people, my wife included, may not be able to watch the entire scene) - but it's necessary if you really want to comprehend the heinous injustice of the situation, which is still taking place all over the Middle East today. Of course it's not indicative of all men in Middle Eastern countries, but it does show a prevalant attitude that exists in the minds of much of the leadership in the area - and still goes on today despite denials from those same governments. It's not an easy film to watch, but you really should see The Stoning of Soraya M.